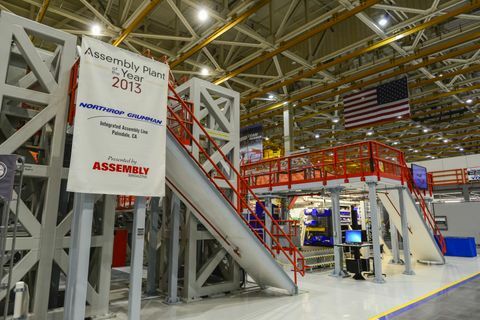 PALMDALE, Calif. – Oct. 22, 2013 – Northrop Grumman Corporation's (NYSE:NOC) F-35 Integrated Assembly Line (IAL) was named "Assembly Plant of the Year" by Assembly Magazine in recognition for the facility's world-class processes to reduce costs, increase productivity and improve quality. Northrop Grumman is the first aerospace company to receive this award. Inspired by automation systems used by automakers, the IAL was designed and developed by Northrop Grumman, working with Detroit-based KUKA Systems Corporation's Aerospace Division, a commercial automation integrator. The IAL is central to producing the F-35's center fuselage as well as driving new levels of efficiency into the manufacturing process, reducing process times, increasing precision and quality, and reducing production costs. "Northrop Grumman has been a leader in designing, developing, and applying automated systems to the complex task of assembling modern fighter aircraft," said Brian Chappel, vice president of the F-35 program for Northrop Grumman Aerospace Systems. "The IAL is one example, where Northrop Grumman maximizes robotics and automation, providing additional capacity and assembly capability while meeting engineering tolerances that are not easily achieved using manual methods." The F-35 Lightning II is a 5th Generation fighter aircraft, combining advanced stealth with fighter speed and agility, fully fused sensor information, network-enabled operations and advanced sustainment. Three distinct variants of the F-35 will replace the A-10 and F-16 for the U.S. Air Force, the F/A-18 for the U.S. Navy, the F/A-18 and AV-8B Harrier for the U.S. Marine Corps, and a variety of fighters for at least 10 other countries.